카프타헤나의 편리한 위치에 있는 호텔 카르타게나 프라자에서 여행을 시작해 보세요. 이 곳에서 생동감 넘치는 도시의 많은 것을 최대로 즐길 수 있습니다. 본 숙소는 도시의 필수 관광 명소에 쉽게 접근할 수 있는 편리한 위치를 자랑합니다. 본 숙소(호텔 카르타게나 프라자)에는 다양한 시설이 있어 카프타헤나에서의 여행 시간을 풍요롭게 해줍니다. 투숙객들은 숙소 내에서 Wi-Fi (무료/전 객실), 장애인용 편의시설, Wi-Fi (공공 장소), 발렛 파킹, 주차장 등을 즐길 수 있습니다. 모든 객실은 편안하고 안락함을 선사해 줍니다. 많은 객실에서 편안함을 더하기 위해 평면 TV, 거실, 무선 인터넷, 무선 인터넷(무료), 에어컨 등을 제공합니다. 본 숙소에서 실외 수영장, 키즈 카페 등을 즐기며 편하고 완벽한 휴식을 취할 수 있습니다. 편안하고 편리한 카프타헤나의 숙소를 찾고 계신다면, 본 숙소(호텔 카르타게나 프라자)가 내 집처럼 편안한 공간이 될 것입니다. 현지 세금 규정에 따라 콜롬비아 시민권자는 VAT를 지불할 의무가 있으며, 체크인 시 숙소에서 지불해 주시기 바랍니다. 해당 세금은 숙소 예약 요금에 포함되어 있지 않습니다. 외국인 투숙객의 여권에 PIP5 도장이 있으면 VAT가 면제됩니다. ATTENTION FOLKS. 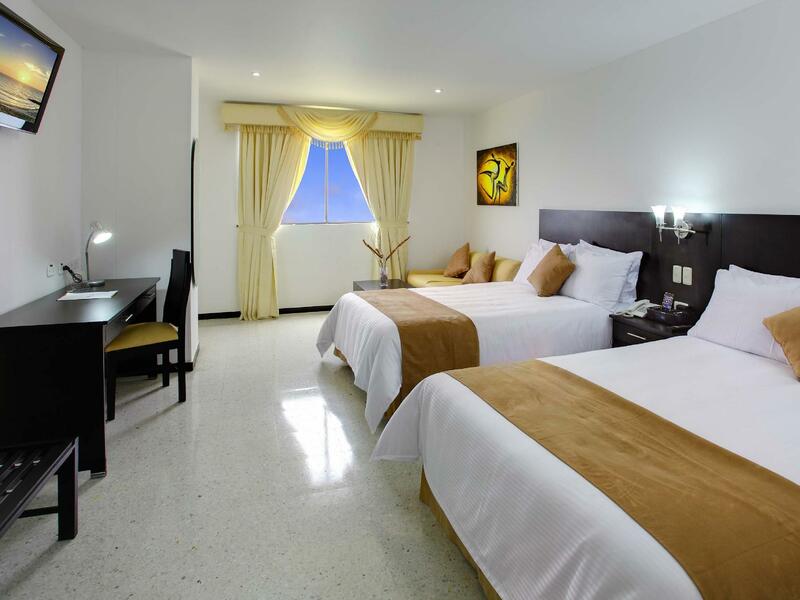 I just had an awful experience with AGODA and CARTAGENA PLAZA HOTEL, in Cartagena de Indias, Colombia. Even though the reservation and the payment were clearly confirmed and the vouchers were with me, I arrived at the lobby of the hotel and they left me with no room and no solutions to solve the issue, which I managed to do after a long wasting of time. If you don’t wanna be upset, be aware of this note. March 8th 2018. Staff is super helpful. Right opposite the beach. Close to banks. Chosen for beach location. Good position, poor decoration, typical bare Spanish style. Ok for the money. Breakfast was like a war, and not very good. Stay was well. The check in process unfortunately was too long. I believe that needs to be changed. 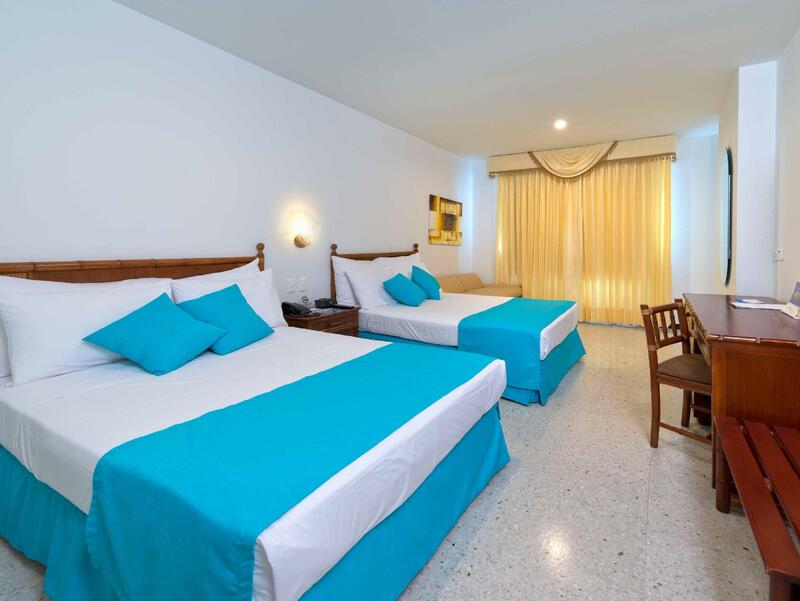 The hotel is located in Bocagrande a 10minute taxi ride from downtown Cartagena. The staff were friendly and were always smiling. The pool is relaxing, but quite small for such a large hotel. The views from all rooms and the pool are lovely. The cocktails are delicious! The beach at Bocagrande is not that great, you will get hassled for cabanas, sunglasses and hats. We took a boat to La Playa de Blanco and it was a nice afternoon on white sands. Negotiate prices first, as some people will try to swindle you. Advice - Check your mini bar carefully,they counted ours but didn't restock and tried to double charge us. Check local information online, the tour operator there doesn't not advise on local prices, only what the hotel offers. The air conditioning did not take the edge off the heat. I found the room was cooler at night if I opened the window. Other rooms had similar issues or so others said. The staff was very rude and difficult when I went to leave. I would recommend the Cartagena Premium in its place. location on beach, friendly staff. Easy to find. 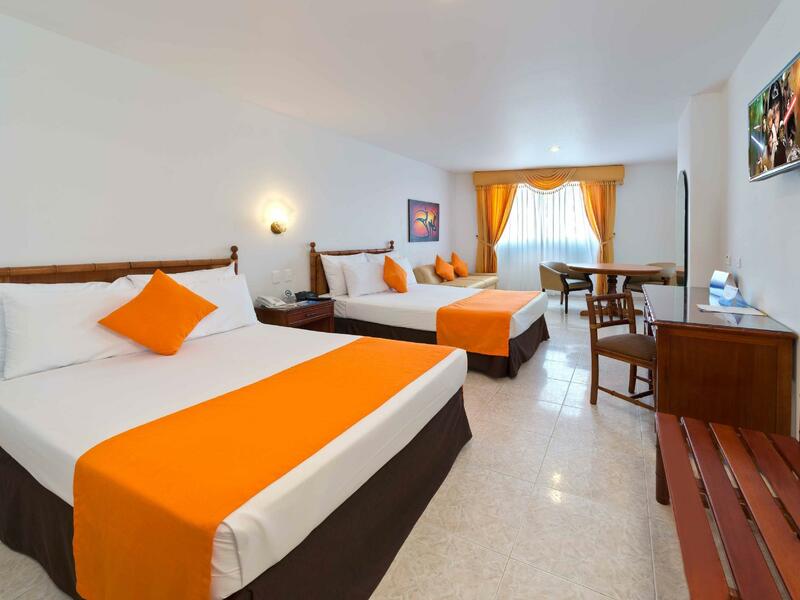 Compared to other hotels price is decent. 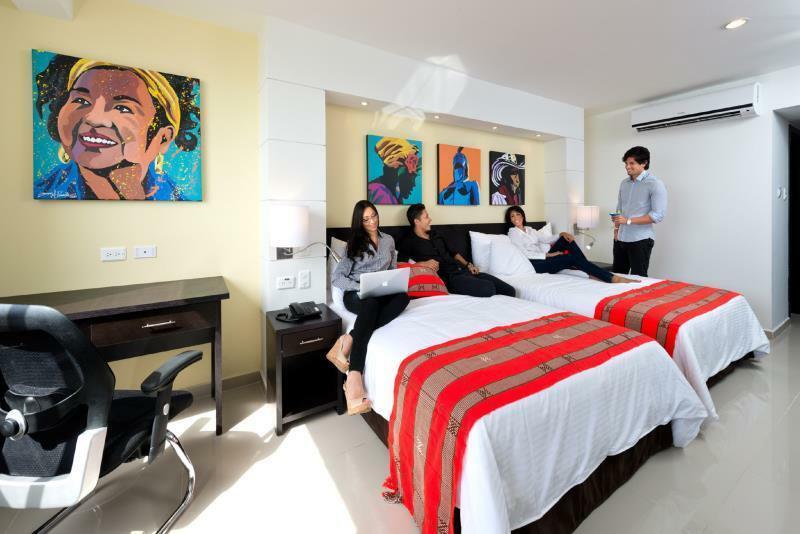 Keep in mind that Cartagena hotels are not cheap though. Hotel was clean, but unfortunately the rooms look like they have never been updated. Would stay again but I would not pay over USD. Rooftop pool is not as nice as pictures on web site. Quick access to old town is nice . 7 minute cab ride. Good service. Pleasant staff. Great location on the beach. Poor lighting in a mediocre room is the first thing to greet you after check in at an uninspiring reception hall. Room was not ventiliated in a while so the stale odour was distracting. AC unit cranked out the chills alright but the noise! Sheets on bed were old and threadbare and had to be changed due to stale odour. Furniture in room old and worn. Good pool and rec area and the view at night from the pool deck of the surrouding city is nice. 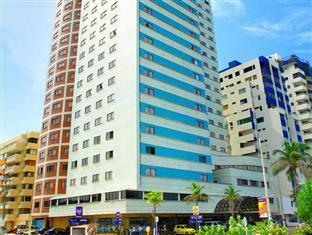 Location, the hotel is located in the heart of Bocagrande and it is right in front of the the beach. Building is old and looks poorly maintained. The food from the breakfast buffet had a poor presentation, looked very sloppy and dirty. 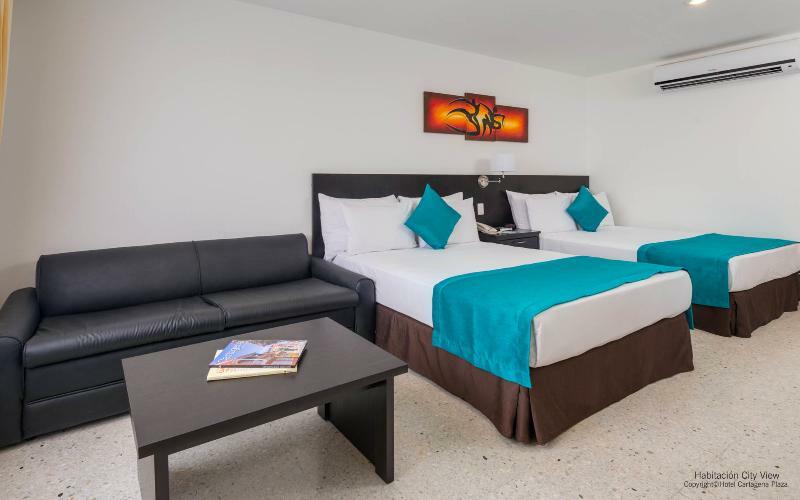 El hotel tiene una excelente ubicación frente al mar,nos alojamos en la Bolívar room, una habitación amplia, aceptablemente conservada, con una hermosa vista al mar; pero, que debía tener caja de seguridad y aunque reclamamos varias veces hasta el día de nuestra partida no había sido colocada.En lineas generales es un hotel antiguo aceptablemente cuidado y limpio.El desayuno esta muy bien es buffet muy variado. La piscina es pequeña.El personal es muy apático y poco servicial en una ocasión olvidaron asear la habitación y cuando reclamamos al menos toallas limpias, tuvimos que esperar mas de 2 horas para obtenerlas.En otra ocasión pedimos un mapa e información de la ciudad y obtuvimos solo el mapa sin explicación alguna.Creo que les falta capacitación en el trato con el huésped. El Hotel está bastante viejo y descuidado, la limpieza no es su fuerte y los restaurantes son bastante regulares. El servicio es bastante lento e ineficiente. En nuestra estancia no funcionaban bien los ascensores, por lo que subir y bajar de la habitación llevaba unos 10-15min. El servicio de alquiler de bicicletas no estaba disponible, ya que todas las bicicletas estaban estropeadas. Una decepción total ya que no se trata precisamente de un Hotel barato. sencillamente muy agradable,lo recomendaria a mis amistades para que lo disfruten como lo hice yo. Близость пляжа и свои пляжные палатки. Ресторан для завтраков похож на столовую, но завтраки приличные. Персонал приветливый, номера большие, но не очень уютные. Правда за те деньги которые мы заплатили все более менее.